My role at Philanthropy Northwest includes planning our annual conference. Bringing people together across our 1.2 million square mile region (Alaska is really big!) for several days of learning, making it worth their time and money, juggling competing priorities for different types of participants, session proposals, meal preferences and our own goals is always an exciting challenge. I've been doing this for 10 years and every year is different, whether it's the twist of an anniversary celebration or an untested location or a series of five Local Matters convenings instead of one big meeting. So when I attend another organization's conference, while I appreciate being able to sit back and absorb the experience without having to constantly check on vendors, I can't help but actively take in the elements I would like to apply to our own conference. 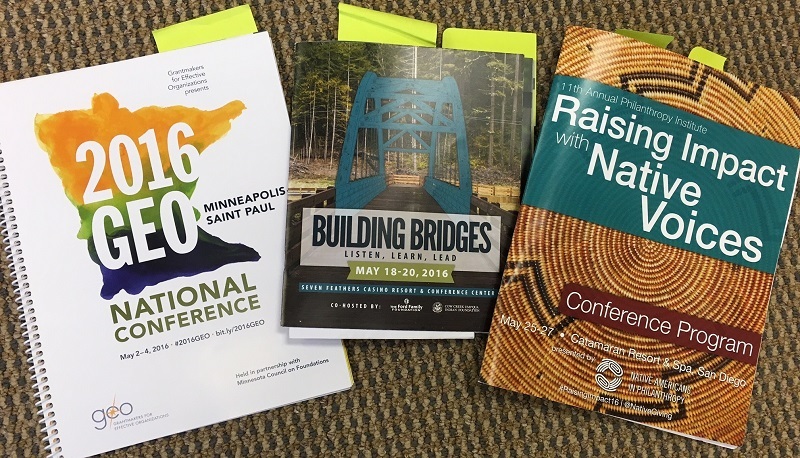 I set a new record for myself in May, attending three major conferences in as many weeks: Grantmakers for Effective Organizations (May 2-4 in Minneapolis), GRANTMAKERS of Oregon and Southwest Washington (May 18-20 in Canyonville, Oregon) and Native Americans in Philanthropy (May 24-27 in San Diego). We have partnerships with each of these organizations, and I've attended their conferences separately in the past, but never all in the same month. I didn't know what I was getting into! But each convening had its own distinct flavor, and the experience of attending them back-to-back gave me a clearer sense of the range of options and styles. Grantmakers for Effective Organizations, National Conference: More than 800 foundation staff and partners gathered from across the country for three days of learning and networking in Minneapolis. The lunch plenary on “Equity as an Effectiveness Imperative” was one of the most powerful talks I’ve attended at a philanthropy conference. (From the buzz that followed it for rest of the conference and since we've returned — including an article in The Chronicle of Philanthropy — I wasn’t the only one who felt that way.) Michael McCaffee, PolicyLink vice president for programs, told a disheartening story about his experience as a black man in foundation work. As a tall, dark-skinned man with intensity and energy, he said that everything about him was interpreted as a sign of aggression; the culture was not ready to handle him and he was sent to anger management training. “We like the idea of diversity but we are not prepared for it,” he said. Since then he has skillfully learned to (unfairly) modulate his behavior. To not do so would take him out of the game, he said, and he refuses to let that be the reason. GRANTMAKERS for Oregon and Southwest Washington, Building Bridges: Listen, Learn, Lead: This biennial conference is a festive gathering of about 200 grantmakers; Philanthropy Northwest co-hosted the 2014 River Gathering in Sun River, Oregon. The location chosen this year, near the site of last fall's Umpqua Community College mass shooting, emphasized the importance of community response and resilience when tragedy strikes. Every community voice is distinct and this was a powerful reminder of philanthropy at the grassroots level. During a moving and emotional panel, Anne Kubisch, president of The Ford Family Foundation, conveyed that having a strong sense of community already built in served them extremely well. Instead of what went wrong or wanting to lay blame, stakeholders moved in solidarity together. Roles were ambiguous, so they asked how they could support each other. In retrospect, this "language of community" set the tone long before the tragedy, and its effects are still being felt. Native Americans in Philanthropy, Raising Impact with Native Voices: More than 100 people gathered in San Diego to create issue-driven partnerships, educate mainstream philanthropy on funding inequities and how we can be a part of community-based solutions. Dr. Robert Ross, California Endowment CEO, summed up the reason why an affinity-based gathering of Native foundation staff and allies is important: place-based work can be scary, exhilarating and messy. When foundations understand that communities know their own solutions, we have to become more willing and patient — no longer philanthropy as usual. Trust and setting aside preconceived notions of mainstream "strategy" is central. As allies, it's important for us to be aware of structural inequalities and oppression, not only in families but in entire communities, and to demonstrate that we want to listen — and that we will follow their lead. Bill Mendoza, executive director of the White House Initiative on Native American/Alaska Native Education, acknowledged that much when he attended the Men's House at the First Alaskans Institute's Elder and Youth conference. After being so moved by the wisdom of the group, he asked Liz Medicine Crow, First Alaskans Institute CEO and Philanthropy Northwest board member, what strategy would follow to move the group to action. In her own words, she conveyed the message that the group itself determines its own course. This reminded me of what we learned at Local Matters: Alaska + Indigenous Communities in October: "Indigenous Ways of Knowing" are real. The biggest takeway for me was the session on "Lost Stories: Finding the Data to Tell Native Narratives." Malia Villegas from NCAI Policy Research Center and Rosalee Gonzalez of the Continental Network of Indigenous Women of the Americas provided overviews about how Native communities are "asterisk communities," meaning that the data are often not big enough to be statistically significant. In a partnership with the Annie E. Casey Foundation's KIDS COUNT, NCAI is now able to present disaggregated data for Alaska and Montana children. The results were alarming and we hope to dig into them at Philanthropy Northwest's conference. But the bigger question is how this data is masking real stories. If we can easily build narratives about trauma and stress, then couldn't we also build narratives of strength and personal agency and self-determination, like Generation Indigenous is already doing across the country? Frank and authentic. Strong sense of place. Urgency and clarity. These five elements are top of mind as our conference committee finalizes sessions for Philanthropy Northwest's 2016 conference and 40th anniversary celebration, Under One Sky in Missoula, Montana, September 13-15. We had more than 60 proposals pitched for 15 sessions, so committee members are hard at work synthesizing and filtering what you would find valuable. So much good stuff came in that we hope to use most of these ideas throughout the conference — if not in a session, then woven through our learning tours, plenaries and informal networking "flock ups." Our Under One Sky theme reflects our theme of bringing people together across boundaries to recognize our common vision — Northwest communities with vibrant, healthy futures that honor our past, our people and our cultures — despite differences in our organization structures, portfolio sizes and funding areas. We hope you will join us and the 94 board members and staff from 40 organizations that have already registered. 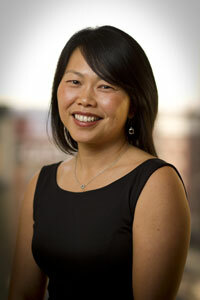 Lyn Hunter is Philanthropy Northwest's senior program manager. She can be reached at lhunter@philanthropynw.org. Thanks for this summary Lyn! GEO was a personal and professional highlight for me this year. Thanks for this incredible post, Lyn. You are an inspiration not only to al of us who craft education opportunities, but through your words and work, everyone in the field. Good luck with your planning for PNW's 40th. It is bound to be wonderful!